A Labour party Senator has been asked to apologise to Michael Lowry after he referred to the Independent TD as a "criminal". There were angry exchanges in the Seanad today when Aodhán Ó Ríordáin claimed the Government is "dependent on the vote of a convicted criminal" following the resignation of Denis Naughten as Minister for Communications. Mr Naughten resigned last week in the wake of the controversy over the National Broadband Plan. The Taoiseach has sought an independent report on the plan to determine if it has been compromised after details of private meals between the Mr Naughten and the broadband bidder were revealed. Independent Senator Marie-Louise O'Donnell labelled Mr Ó Ríordáin's comments "appalling" and asked him to apologise to Mr Lowry. The Labour senator said it is a "matter of grave concern" to him that the Government is now dependent in a formal way on the support of Mr Lowry. He said he also finds it "disturbing" that Minister of State Pat Breen has not explained himself to either the Dáil or Seanad about his engagement with businessman David McCourt and Mr Naughten. He said: "I consider it to be absolutely outrageous that the Minister of State would arrange a dinner with a constituent of his and arrange for a senior minister to travel over 170 miles to come and eat dinner with this person. "And we are supposed to believe that they never discussed the contract or the tendering and were also expected to accept that because the minister of State Breen had no involvement in that department that that's okay." Then Mr Ó Ríordáin made his comments about Mr Lowry: "Number one, you are dependent on the vote of a convicted criminal. "And number two, you are trying to move away from a controversy where a Minister of State arranged a dinner with a bidder for a contract." He was interrupted but he continued: "He has a criminal conviction for tax irregularities. And now you are trying to move away from a controversy in relation to the actions of a Minister of State facilitating a dinner between a bidder and a senior minister for which the senior minister resigned. "If you are trying to move away from that situation it says a lot about the Fine Gael party." His party colleague Kevin Humphries also asked that Minister Breen be asked to come into the Seanad and make a statement about the issue. Senator Marie-Louise O'Donnell said Aodhán Ó Ríordáin's comments were "appalling"
Later, Independent Senator Marie-Louise McDonnell said: "Senators who call deputies criminals are out of order. Especially when they are not criminals." She took issue with Mr Ó Ríordáin calling Mr Lowry a "criminal three or four times. We all know deputy Lowry's situation in relation to tax and business. It has been well documented in the press and the courts. I think he has been completely wide of the mark to actually call him a criminal." Ms O’Donnell added: "That is a very loaded word. I think he deserves an apology. I thought it was appalling. I think it is the weakest or arguments when people start calling other people names." She said she is "appalled" that Mr Ó Ríordáin was not thrown out of the Seanad for his comments. She concluded that she is not apologist for anyone but she does not want to be part of a senate where people are called "criminals". 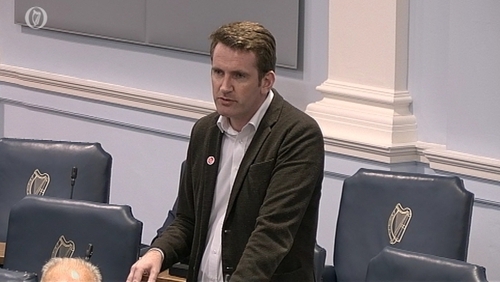 Leas-Cathaoirleach of the Seanad, Paul Coghlan said that had asked the Labour senator to "tone down his language". He said: "Deputy Lowry was convicted of an offence in the criminal court. I am not going to say he is a criminal. "I didn't like the language and I asked Senator Ó'Ríordáin to tone it down."